Gulgong Gold Experience is located on Red Hill where gold was found in 1870 by Tom Saunders. The gold rush that followed this find was to become known as ‘the last of the poor man’s gold rushes’. The Gulgong Gold Experience has been excavated into the slopes of Red Hill and incorporates the original commissioned tile mural that was erected in 1988 for the Centennial Celebrations which depicts the gold leads of Gulgong. 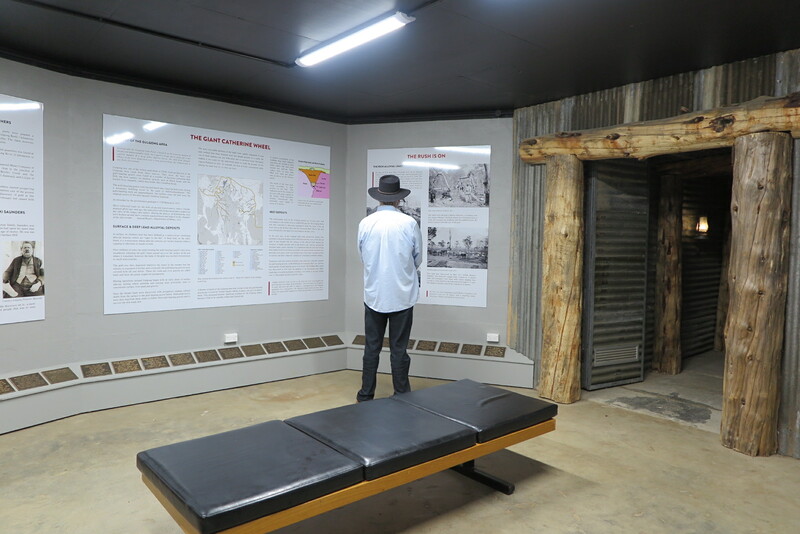 This interesting structure now serves as the information ‘hub’ for the facility and houses detailed audio and visual displays of Gulgong’s gold history. 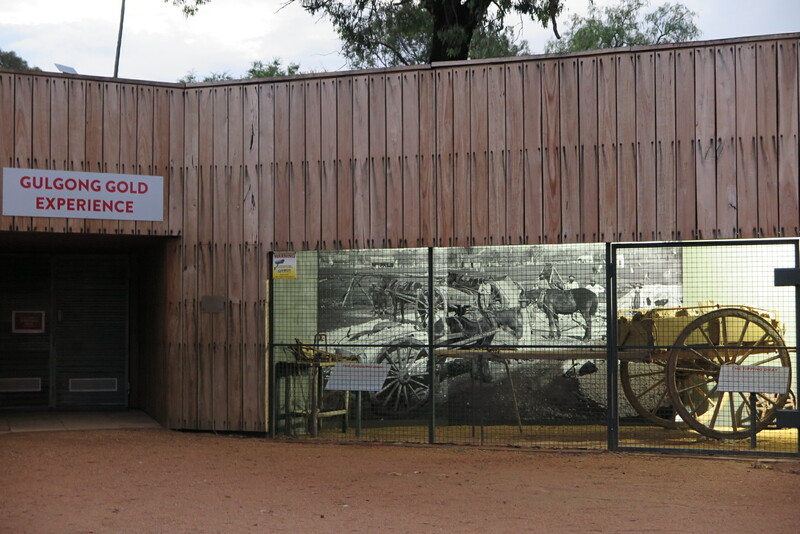 On entry, visitors are given an insight into life on the Gulgong gold fields with an enlarged Holtermann photograph of a puddling scene, along with an original dray and audio presentation. 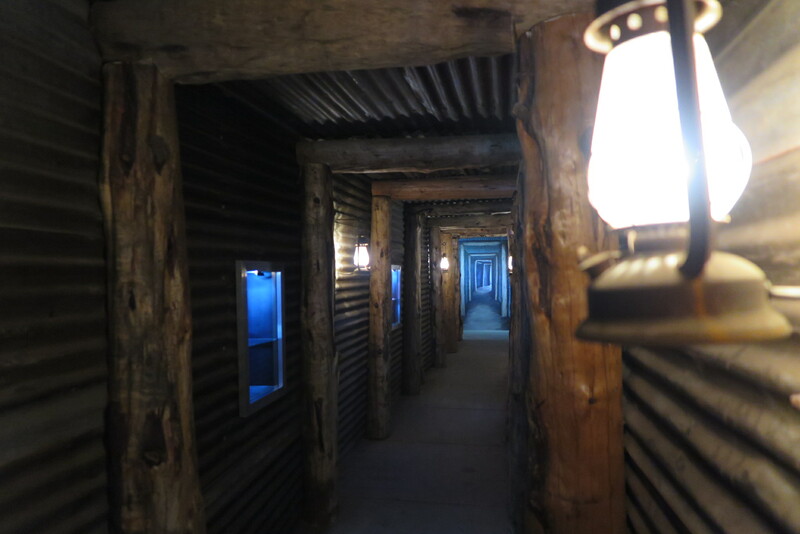 The underground theme is carried on through the facility with a replica mining tunnel fitted out with interesting audio and visual displays. Once above ground the examples of quartz, the view down an original mine shaft, the old miner’s cottage and the tranquil view over Red Hill, all form part of the Gulgong Gold Experience. For those who are a little more adventurous, panning activities are available. Mullock heap dirt is available, however, as gold is rather difficult to find, we can guarantee you will find some brilliant gems when you purchase one of our calico activity bags which included your pan hire and a gold poppet head souvenir coin.